When you will work with charts or shapes or these kind of objects then special types of tabs will appear in Excel Ribbon Tab zone. These contextual tabs contain commands related to objects that you have selected. For example, if you add a rectangular shape in your worksheet and select it, a contextual tab naming ‘FORMAT’ will appear after the last tab in the tab zone. 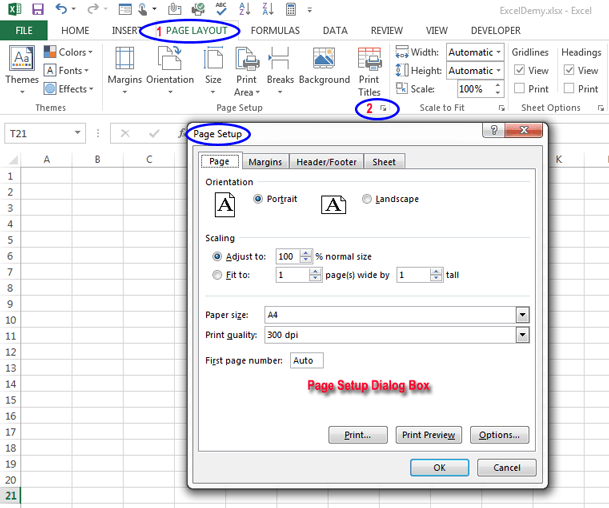 Open your Excel program and create a new worksheet. When you have opened your worksheet, click the Insert tab. Click on the ‘Shapes’ button of ‘Illustrations’ group of commands. Click the ‘Rounded Rectangle’ shape from ‘Rectangles’. 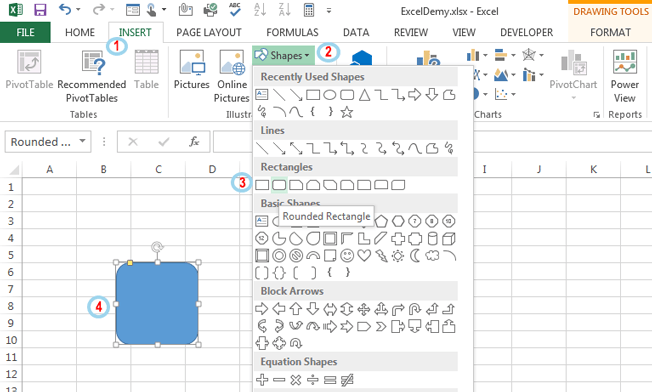 Click anywhere on your worksheet to place your selected ‘Rounded Rectangle’ shape. Select the new shape by clicking on it. You will see the contextual tab, labelled ‘Format’. ‘Format’ tab will be visible only if you select the shape. What is Ribbon in Excel? Contextual Tab. Step 5. Under every tab, the command buttons reside in the group. A group contains loosely similar commands. 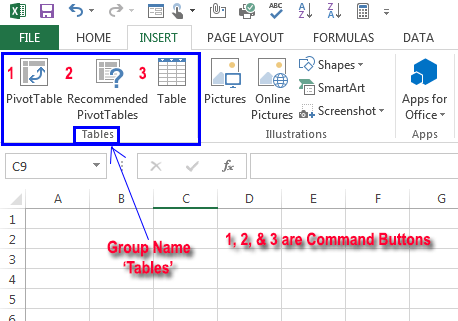 Under ‘INSERT’ tab, the ‘Tables’ group of commands is made up of ‘PivotTable’, ‘Recommended PivotTables’, and ‘Table’ command buttons. What is Ribbon in Excel? Group of commands. Some groups may have more commands that they are showing in the Ribbon. For example, ‘PAGE LAYOUT’ tab’s ‘Page Setup’ group has more commands than it is showing in the ribbon. How did we understand this? As there is a small arrow located in the lower-right corner of ‘Page Setup’ group. Click on this small arrow and the dialog box will appear on the screen with more commands. What is Ribbon in Excel. Dialog box launcher.